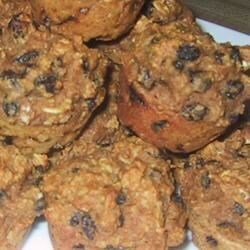 These healthy, moist, and delicious Molasses Raisin Muffins are a perfect way to start each morning. Preheat oven to 350 degrees F (175 degrees C). Grease 12 muffin cups. Beat together the yogurt, egg, molasses, raisins, wheat germ, oats, and butter in a large bowl until evenly mixed. Sift the flour, baking soda, cinnamon, ginger, cloves, and salt on top of the molasses mixture. Fold the flour mixture into the molasses until a batter has formed. Pour batter into muffin cups, filling to the top. Bake in preheated oven until a toothpick inserted into the middle of a muffin comes out clean, about 25 minutes.